Manger | Hi, I'm Coeliac too! 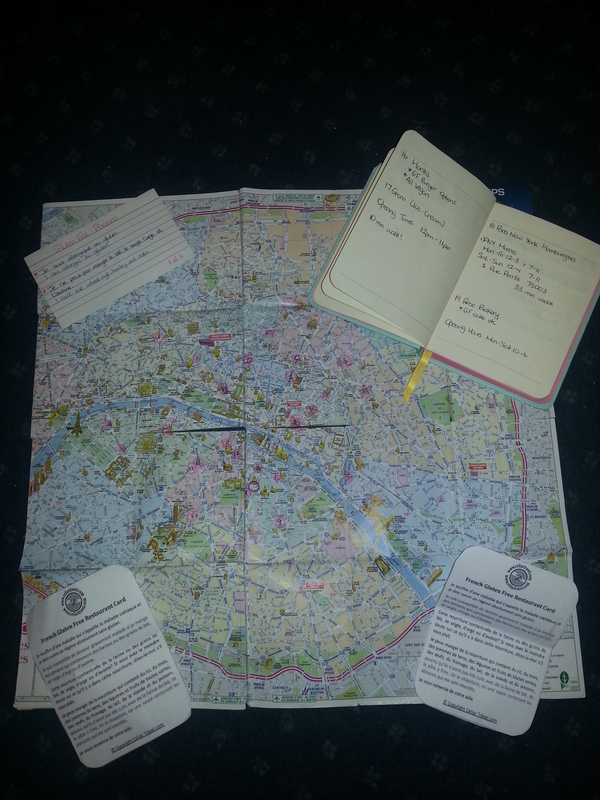 Planning for Paris & Eating Out! Holidaying as a Coeliac always makes me panic! Not knowing where I can eat or if I can eat anything worries me here in Ireland, so not having any French made it even worse! It was time to do a lot of research! We found many helpful blogs along the way. Being the organised pair we are, we made a notebook with all the restaurants, shops and cafes that we found with gluten-free options. In our notebook we wrote the address and opening times of many of the places! We also made our very own Gluten Free Food Map so these places would be easy to find! In total we had 22 places wrote down and found a few others along the way. I also wrote down Gluten Free Phrases and got Gluten Free Restaurant Cards. To say we were prepared would be an understatement! While in Paris I went to restaurants and bakeries that we did not find a Gluten Free Menu for. Twice I got a good old Omlette and Chips and another time I got Chicken and Chips. I also got two giant Macaroons, a Vanilla one and a Strawberry one that were a nice treat! Thankfully there was no cross-contamination or side effects from eating in these places!